The In the late 1960s the close ties between France and Israel began to cool down, first with the French weapons embargo during the Six Days War (the Arabs were armed by the Soviets so the embargo mainly hurt Israel) and finally with the embargo following the Israeli commando raid on Beirut airport in December 1968 (following an attack by Palestinian terrorists on an El Al aircraft). France refused to deliver the 50 aircraft already ordered by Israel and instead used them to arm its own air force. The need in Israel to replace more than 60 aircraft lost during the Six Days War and the ongoing War of Attrition that followed it prompted Israel to privately acquire the Mirage 5 blueprints from Dassault and to secure the engine blueprints through espionage. Under the codename "Nesher" (Vulture) Israel Aircraft Industries secretly began the construction of the new fighter in its Ben Gurion Airport facilities. On March 21st, 1971 the first aircraft took to the air and supplies to the IAF began by May of the same year. At first some disappointment was voiced over the aircraft's air-to-air characteristics but these were gradually silenced and finally disappeared after the aircraft's excellent performance during the Yom-Kippur war of 1973. In total 51 single seat Nesher A's and a further 10 double seat B's were built before production ended in 1974 . The type equipped 4 fighter squadrons - "First Fighter" squadron, "First Jet" squadron, "Hornet" & "Guardians of the Arava". The first aerial victory of a Nesher took place on January 8th, 1973, when 4 Neshers from the "First Fighter" squadron escorted F-4 Phantoms into Syria to attack a terrorist base. In an engagement with Syrian MiG-21s, 6 MiGs were shot down, two by the Neshers. The Nesher enjoyed great success in the Yom-Kippur war with dozens of Egyptian, Syrian and Libyan aircraft shot down, the "First Fighter" squadron alone scoring 59 victories for the loss of only 4 planes. One of the first victories of the war was not an aircraft but an AS-5 Kelt air to ground missile launched against Tel-Aviv by an Egyptian Tu-16 Badger on the first day of the war, October 6th, 1973. 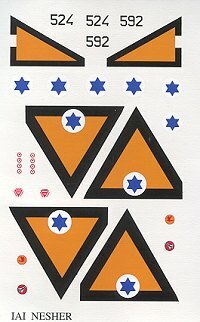 When Libyan Mirage 5s entered the fighting all Israeli Mirages and Neshers were marked with large yellow triangles bordered by a thick black frame to prevent a case of mistaken identity. At least two Mirage 5s were shot down by Neshers, as well as an Israeli Phantom shot down by mistake, the navigator and the pilot, a former Nesher squadron commander, parachuting to safety. By the end of the war Nesher 510 had shot down 13 enemy aircraft while 561 had shot down 12. Between 1978 and 1981 the Nesher was retired from service, replaced with Israel's next locally built fighter, the Kfir. Exported as the "Dagger", 35 single seat examples were sold to Argentina along with 4 two seaters. These took part in the Falklands War of 1982, attacking the British task force sent to recapture the islands, facing Sea-Harriers during the landing at San Carlos. There were still 25 Daggers in service with the Argentinian Air Force (FAA) in 1993, though most if not all have been retired by now (2003). 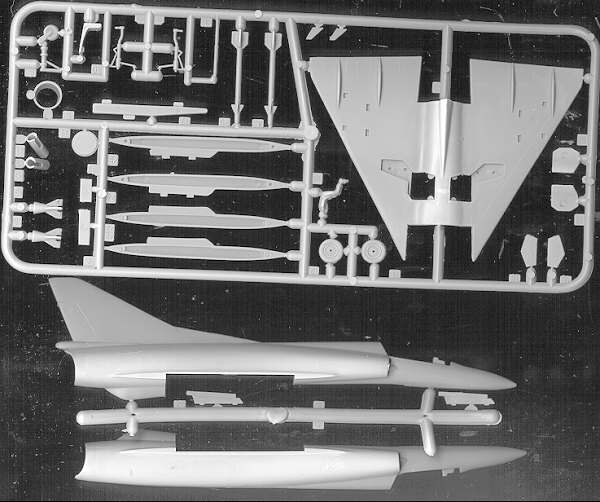 This is basically a reboxing of the earlier PM Mirage V kit. I see very little difference between the two other than the decals. The kit itself has raised panel lines, a minimalist cockpit and requires some real help for the intakes. There is no blanking plate and they are larger in the horizontal plane than in the vertical, making them jut out too far. The nose also seems a bit too bulbous to me, but I'm not a Mirage expert so that may be normal. There are ejector pin marks on most parts, including the underside of the one-piece wing. No speed brakes are shown on the wings and the main wheel wells have a roof, but will need to be boxed in on the sides. The wings are ready for pylons by having the slots precut, though I won't vouch for the accuracy of the pylons. Two drop tanks and two sidewinder mounts are provided for the wings while a centerline pylon is given for a pair of bombs. Landing gear are fair as are the wheels, but they are in real need of detailing. The single-piece canopy is a bit hazy and mine had some flash. Instructions are adequate in that there are several construction sequences showing parts placement. No interior or wheel well colors are provided. Markings are for two similar planes in colorful sand, green, brown over grey camo scheme. The painting guide is excellent, providing paint info in several different brands. Decals are fairly well done though show a bit of ink bleed on a few of them. Since this is a rebox of a much older kit, it doesn't come up to the standards of the newer releases. In fact, there are few advanced modelers who would seriously choose this as a kit to build. This is a kit that is more designed for a newer modeler who doesn't really care about it being real accurate, but just wants a neat model that won't be a real hassle to build.